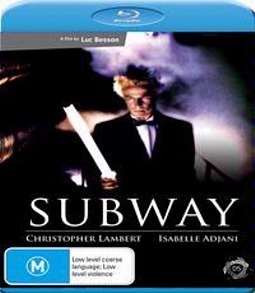 Though it may not be the most cogent entry in the Besson canon, Subway still has much to recommend it 25 years after its initial release, and the R4 Blu-ray release will be welcome news for fans of the French director’s inimitable visual flair. The action opens with the dinner jacket-clad Fred (Highlander’s Christopher Lambert, here credited as Christophe) driving down a motorway, a BMW full of equally suavely attired villains in hot pursuit. In typical Besson fashion however the car chase doesn’t go entirely according to filmic convention: Fred refuses to take part until he has located his favourite cassette, fumbling around as his car is repeatedly rammed by that of his pursuers. Eventually he manages to get the appropriate chase music blaring, and the thrilling sequence continues at ridiculous speeds through the streets of Paris. We soon learn that Fred is a thief, a safe cracker, and has stolen some valuable documents from the home of a wealthy businessman. In his efforts to elude the incensed victim’s henchmen Fred seeks refuge in the Parisian subway system, where he comes into contact with a ragtag assortment of drifters, hustlers, dropouts and dreamers, each with their own reasons for seeking shelter in this subterranean, artificially illuminated world. Jean Reno and the stunning Isabelle Adjani lead an immensely talented ensemble cast, and a typically intoxicating score from longtime Besson collaborator Eric Serra adds to the unpredictable, occasionally carnivalesque atmosphere. Part heist movie, part unlikely love story, Subway feels occasionally as though its characterisations take precedence at the expense of the plot, but remains an effective and darkly comic turn from the then-budding auteur (despite this being his second feature Besson was only 25 at the time of production). Madman’s release is again short on extra incentives, but the film itself won’t leave viewers wanting. The present transfer looks a little grainy and washed-out. It also appears to have been sourced from more than one print, and unfortunately both show their age. It’s still superior to any DVD edition thus far released on local shores, but a far cry from the crystal clear image most of us have come to associate with Blu-ray. On the audio front only an LPCM French 2.0 is on offer, though it proves strong and clear, with decent separation. None. Oh wait, there’s a theatrical trailer. So none, really.